It’s is no secret that El likes reading. Her favourite books of all are classics such as Black Beauty, Ballet Shoes and Five Children and It. And the Railway Children, Heidi and The Secret Garden. Not forgetting A Little Princess, Little Women, White Boots, Tennis Shoes, Dancing Shoes and What Katy Did (that’s not all of them). OK, just assume she likes them all. When your child is a really confident reader it can be hard to find books that are engaging and interesting without seeming too babyish. This is why classics are great – you’ve got a story that’s stood the test of time, language that is old-fashioned enough to be fairly challenging and a story that’s suitable for a wide age range. So when we were asked to review a special edition of a classic book it was definitely Happy Dance Time. The book in question is Wind in the Willows and it’s been specially produced by The Folio Society. It’s a large hardback, comes in a protective slip case, and is bound in cloth and blocked in black and gold. The paper is quite thick and the whole package has a lovely feel to it. Most pages have a gorgeous illustration – we enjoyed the fact that these were quite old fashioned and featured delights such as Mr Toad smoking a cigar and drinking his whiskey! You don’t get so much booze and fags in children’s books these days. Despite all this it’s still quite an innocent world, as Toad, Ratty, Mole and Badger enjoy adventures by the riverbank. Just watch out for the ‘Poop Poop’ of Toad’s car! It is a beautiful edition and we would recommend it for a very special present for your favourite reader. El is VERY CAREFUL with her copy and it’s not the kind of book you would read in the bath or take on a journey. At £32.95 it’s not a cheap book, but it’s very much a book to keep and treasure. A keen reader would love this, or it would make a good present for a smaller child you’re hoping to entice into the love of books. El is very proud to have this on her shelf and will keep it forever and ever. And ever. And ever. February 7, 2013. 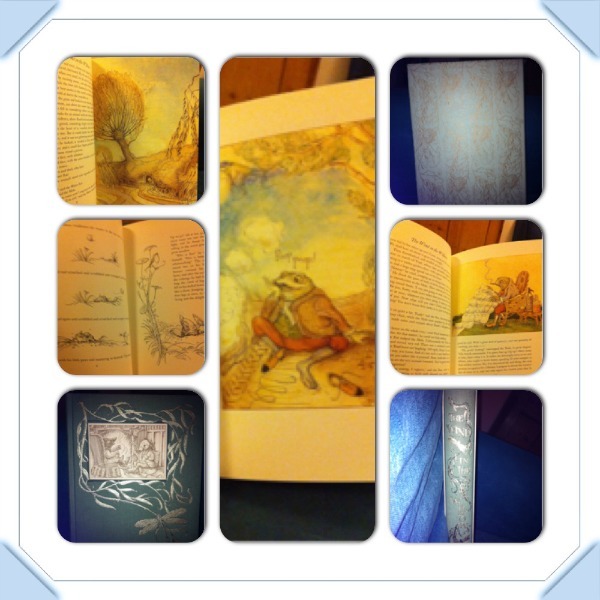 Tags: book, classic, folio society, wind in the willows. Uncategorized.